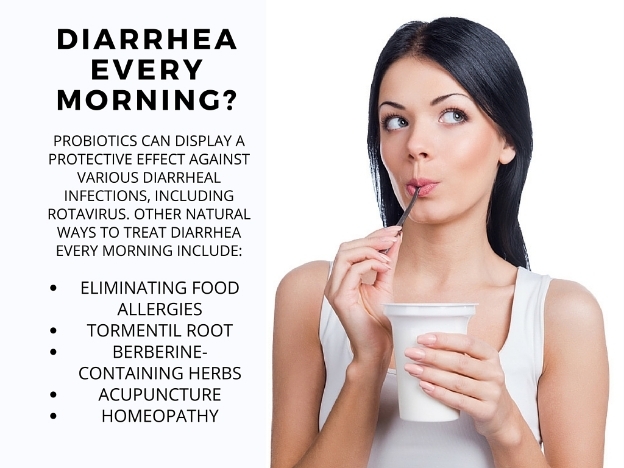 Get Diarrhea Every Morning? Here’s Why! Diarrhea is one way the body tries to rid itself of an unwanted substance. It does so by secreting extra fluid to the intestines and producing an unusual number of strong intestinal contractions, leading to an increased amount of loose, watery stools. This is often triggered by a bacterial infection. Everyone experiences diarrhea at some point, but for some, diarrhea is a problem; for example, the urge to have a loose bowel movement may disturb sleep. And some people are afflicted with diarrhea every morning. What does diarrhea in the morning mean? It could have been something you ate the night before that isn’t agreeing with you. Or maybe your long, late-night workout increased your bowel motility. Even your morning cigarette or coffee can cause loose bowel movements. There are several things that might trigger morning diarrhea. It could be a simple change in a person’s circadian rhythm (or, body clock). Say a person has a bowel movement in the late evening and then tends to have another one around 8:00 a.m. If this cycle is disrupted, loose bowel movements may occur at uncommon times. What are the main issues or problems with diarrhea every morning? Stomach cramps along with diarrhea is definitely a cause for concern, as these symptoms can indicate a particular gastrointestinal disorder. Irritable bowel syndrome (IBS) is one of the most common causes of diarrhea every morning. IBS is estimated to affect 20% to 30% of the American population. 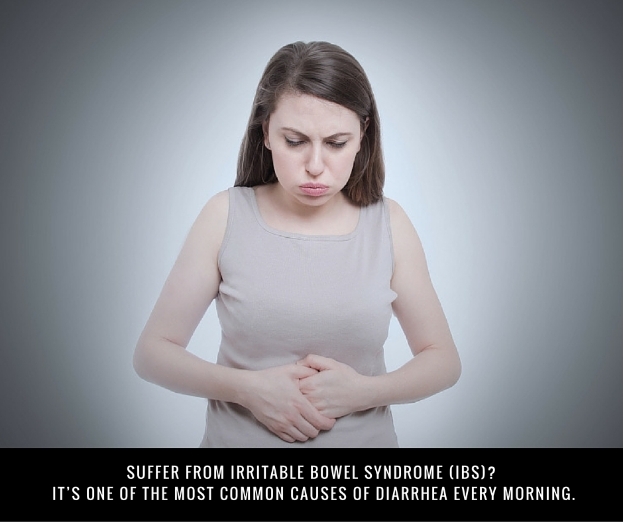 In IBS, bowel movements are considered erratic, irregular, unpredictable, and painful, and the person will experience diarrhea, constipation, or they may alternate between both. The cause of IBS is unknown, but stress, food allergies or sensitivities, dysbiosis, parasites, and Candida overgrowth are among the main triggers of its symptoms. Inflammatory bowel disease (IBD) is a general term for chronic inflammatory intestinal disorders, which include Crohn’s disease and ulcerative colitis. While Crohn’s disease is associated with watery diarrhea, ulcerative colitis is linked with bloody diarrhea and lower abdominal cramps. These symptoms will often occur right from the time you get up in the morning, and they may even disturb your sleep. Chronic diarrhea is a symptom of a viral or bacterial infection. The most common viral infections that cause diarrhea include rotavirus, norovirus, and adenovirus. The rotavirus in particular is a common cause of baby diarrhea every morning. Bacterial infections can cause serious cases of diarrhea, often occurring after the consumption of contaminated food or water. Shigella, Salmonella, and Campylobacter are the most common bacterial strains that cause diarrhea. Other symptoms associated with bacterial and viral infections include inflammation, fatigue, cramping, vomiting, fever, sneezing, and coughing. Nicotine and alcohol abuse is a common cause of bowel irritation. These substances are commonly consumed in a binge at night; as a result, morning diarrhea often follows. Substance abuse–linked diarrhea can occur both in isolated instances and in those who drink and smoke regularly. The use of medications such as antibiotics can also cause diarrhea every morning. Although antibiotics can induce diarrhea at any time, it can also occur in the morning due to internal organs becoming active after being dormant throughout the night. Since the antibiotic has stayed in the blood overnight, it can then trigger diarrhea in the morning. Diarrhea can also be caused from cancer drugs, weight loss drugs, antacids, gout medications, and drugs for blood pressure issues. Hormonal fluctuations associated with pregnancy can cause morning diarrhea and nausea. Pregnancy increases hormone levels, such as estrogen and human chorionic gonadotropin. These hormonal fluctuations can cause morning diarrhea and nausea (i.e., morning sickness). Diarrhea is a common side effect of a parasitic or Candida infection. Candida albicans is one of the many fungi that can grow within the gastrointestinal tract. There are also several parasites known to cause diarrhea, including Giardia lamblia, Cryptosporidium, and Entamoeba histolytica. Other symptoms of Candida and parasites include constipation, food allergies, and fatigue. The likelihood of having a bowel movement decreases when a person is sleeping or relaxed. However, bowel movements can occur when a person wakes up with intense emotions. For instance, anxiety is a common emotional cause of diarrhea. Thankfully, diarrhea anxiety often goes away once the stressful situation has resolved. Abdominal cramps, bloating, and diarrhea are common digestive complaints associated with food allergies and intolerances. Common food allergies include milk, eggs, wheat, and peanuts. Most food sensitivities and intolerances are acquired throughout life, the most common of which are wheat, gluten, and dairy. Electrolytes are minerals with an electric charge such as magnesium, phosphate, sodium, potassium, chlorine, and calcium. When electrolytes become too high or too low in the body, dehydration can result. Symptoms such as diarrhea, constipation, and cramps are associated with dehydration and electrolyte imbalance. There are several treatment options for recurrent diarrhea in the morning, but of course they depend on the cause. A holistic nutritionist or naturopath can tell you how your diet and lifestyle are affecting your health through a comprehensive interview and diet diary. Probiotics are beneficial bacteria used to restore intestinal flora, the most important of which are Bifidobacterium bifidum and Lactobacillus acidophilus. Probiotics can display a protective effect against various diarrheal infections, including rotavirus and Clostridium difficile. Probiotic supplementation can prevent antibiotic-induced diarrhea, and promote recovery from it (1). Certain foods are commonly understood as being healthy, but they can also worsen digestive symptoms in some people. That’s why it’s important to determine which foods may be potential triggers. Food sensitivities can be detected in a number of ways, including bio-analysis with bio-energetic testing, bio-meridian testing, a meridian stress assessment test, an elimination diet, or an enzyme-linked immunosorbent assay. A randomized, double-blind, controlled study published in the Pediatric Infectious Disease Journal in 2003 (2) found that tormentil root extract shortened the duration of diarrhea caused by rotavirus. The study included 40 children with rotavirus-induced diarrhea between the ages of three months to seven years. The duration of diarrhea was 60% less in the tormentil root extract group when compared with the placebo group. Plants that contain the alkaloid berberine have a long history in the treatment of infectious diarrhea. Berberine-containing plants include goldthread, barberry, Oregon grape, and goldenseal. In clinical studies, berberine has been found to be effective against diarrhea caused by parasites, E. coli, shigellosis, cholera, and food poisoning. Studies have even found berberine to be more effective than standard antibiotics for diarrhea. Acupuncture is another treatment option for chronic diarrhea sufferers. For instance, a study published in the journal Chinese Acupuncture & Moxibustion in 2013 (3) found that acupuncture is effective in diarrhea-predominant IBS. A study published in the Chinese Journal of Integrated Medicine in 2009 (4) also found that moxibustion on certain acupoints is effective in the treatment of infantile cerebral palsy. Multiple studies have found that homeopathic remedies help decrease the duration of diarrhea and the number of stools in children with acute childhood diarrhea, including findings published in the Journal of Alternative and Complementary Medicine in 2000 (5). Aloe socotrina is a remedy that is particularly helpful. Other homeopathic remedies used for sudden morning diarrhea include china, sulphur, and arsenicum album. There are a number of herbal remedies used for diarrhea and other related digestive disorders. For instance, the antifungal properties of peppermint oil make it effective against intestinal cramping and diarrhea associated with Candida overgrowth. Other herbal remedies used for diarrheal disorders include ginger, astragalus, oregano oil, cranesbill, marshmallow, slippery elm, milk thistle, grapefruit seed extract, wormwood, black walnut, propolis, rhubarb, red raspberry, skullcap, aloe vera juice, and gentian root. Other supplements that can help treat diarrhea and associated causes include digestive enzymes, diamine oxidase enzyme, betaine hydrochloride, activated charcoal, colostrum, L-glutamine, lactase, vitamin C, and vitamin A. When diarrhea in the morning is a problem, it’s best to focus on hydration. Avoiding substances: Avoid alcohol and caffeine, which are known to stimulate the digestive tract. Keeping hydrated: When diarrhea in the morning is a problem, it’s best to focus on hydration. Consume two cups of liquid every couple of hours, including water, freshly squeezed fruit and vegetable juices, and bone broths. Aromatherapy: Several essential oils have antispasmodic properties that relieve stomach cramps and diarrhea every morning, including lemon balm, lavender, and chamomile oils.